I got the job writing the SeeSaw Book Club. One of the first assignments I was asked to perform was to write brief promotional brochures on three authors: Ann McGovern, Johanna Hurwitz, and Norman Bridwell. I was given their phone numbers, told to call them, set up an interview. “On the phone?” I asked. I stared at that phone for a few minutes, mustered up my courage, and pushed the numbers. That’s the first time I spoke with Norman Bridwell. He was then, as he would forever remain, a humble, soft-spoken, generous man. 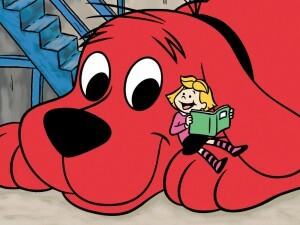 The first Clifford book, published in 1963, came out in two-color, in an inexpensive, horizontal format. It looked cheap, because it was. But in the early 80s somebody at Scholastic had the bright idea of repackaging those books in a mass market, 8″ x 8″ format — and in vibrant full color. 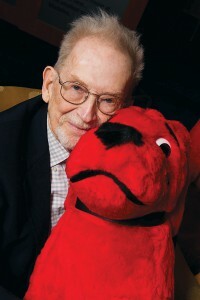 The books took off and the Big Red Dog became one of the great success stories in children’s literature. In fact, one can accurately imagine the Scholastic corporation as a great sled with Clifford the Big Red Dog hauling it through the snow. That benign character helped propel a company to greatness. Through it all, Norman remained the same kind, gentle man. No one ever spoke badly of him. No one, not ever. He was always courteous, generous, kind. Even grateful, I think. Norman always seemed to consider himself lucky. And the truth is, he was fortunate. I don’t think anyone makes it really big in this business without a little luck shining down on you. Norman understood that. He deserved his success, for he had created something pure and genuine that touched hearts, and through it all he remained faithful to the essential core of what those books were all about. The love between a child and her dog, with a bunch of jokes and gags thrown in to get you to that final hug. One other quick story about Clifford. It was sometime later, let’s call it the early 1990s, and I was in Ed Monagle’s office, chatting away. At that time, I’d moved upstate, gone freelance, and was trying to survive as a writer. (True story: I’m still trying to survive as a writer.) Ed was a terrific guy, but also a numbers guy. A financial analyst, chief bean counter at Scholastic. Ed cared about the books, and believed in the central mission of the company, but he was also impressed by profit-and-loss statements. He admired Clifford’s sales numbers, and respected the size of Norman’s royalty checks. That’s the thing with magic, I guess. It never looks difficult. Ed was right, of course, the idea was laughably simple. He was also completely wrong. Clifford the Big Red Dog was an exceptional idea, marvelous in its simplicity, executed to perfection. Not so easy after all. Norman Bridwell passed away this week. And I’m here to say, very quietly, that he was a really good guy. I’m sorry to see him go.